"The band was considered highly innovative at its inception, but in retrospect it's easily classifiable as straight-forward neo-folk, albeit at its very finest. These days? Geez, I mean, we're hearing something like a blackened, post-industrial Loop or Jesus and Mary Chain. Or maybe even what the Birthday Party would've sounded like if they were a suicidal '70s psych group. Staccato dirges grab distorted basslines and ride them into droney psychedelia, underneath a sky of swirling guitar leads and brutal, haunting vocals." Swans, Crass, Nick Cave, Dead Can Dance, Death In June; all of these iconic acts have displayed unprecedented innovation destroying genre barriers and pushing music forward. 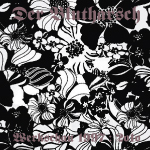 Within the fold of this tradition are unsung pioneers Der Blutharsch, whose music spans more than a decade and has evolved from being a raw, Earthy neofolk controversy to a rich, psychedelic, sonic revolution. Handmade Birds has curated this one time, limited pressing of a Der Blutharsch retrospective, sampling an average of three tracks from each record between 1997 and 2010. "There is a delicate balance that few seem to own- the dialogue of timbres, choice of instrumentation, layering of textures- the manipulation of sound that, at its lowest point can still sway emotion, and at its highest point leads to a rethinking of traditional song structure. Der Blutharsch embodies sonic innovation. If one looks at the songs on this retrospective as mathematical equations, and peels back each layer of the musical text, what can be found is a thoughtful scaffold constructed with the care of a watchmaker’s hands. Free of presuppositions, controversy, and pretension, these songs stand erect as pillars of sonic strands pioneered by a brilliant, albeit unorthodox, musical mind, Albin Sunlight Julius, whose prolific history of genre defying masterworks has had an enormous impact on countless musicians who are all still humbly seeking that delicate balance- something that Julius both owns and continues to refine. Please enjoy playing witness to the progression of this important band, the first fifteen years of which are documented on these two records." "...the musical vision of Albin Sunlight Julius has gradually blossomed into a multi-faceted device of creation. Incorporating, among many other elements, neoclassicism, psychedelia and martial bombast in the consistently brilliant releases of various formats that have so far constituted the constant metamorphic process, Julius has nevertheless never shifted his focus from the very inner essence of the project..."
"Der Blutharsch is the sane voice in a time of shameful peace, hysterics and militant consumerism..."